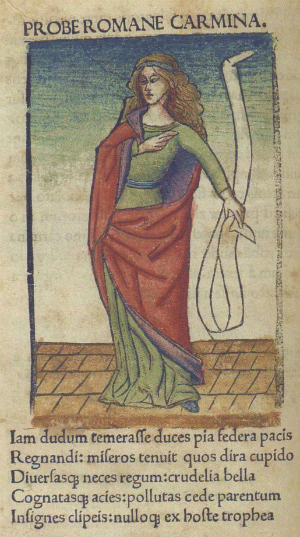 The first five lines of cento Probae with a depiction of the author, holding a scroll. The most famous female writer from Greco-Roman antiquity would have to have been Sappho, the lyric poet from the island of Lesbos, but for womens history month I’m going to shout out for a Latin author by the name of Proba. Faltonia Betitia Proba was born to an aristocratic Roman family early in the fourth century. This was a period of great religious flux, and Proba herself converted to Christianity. We know of two works by her: a lost work on the war between Constantius II and the usurper Magnentius, and the extant cento Probae. A cento is a work composed of resequenced lines (or half-lines) from an existing work, arranged to create a new narrative. Proba’s cento of nearly 700 hexameters resequences verses from classical Latin literature’s canonical highpoint – Vergil’s Eclogues, Georgics and Aeneid. The cento’s new narrative follows the contours of the Old then New Testaments – it is an extraordinary work of consummate knowledge and empassioned faith. In some respects, Proba might not be considered terribly radical – after all, as a woman married into a consular family, who wrote in the service of the State and the Church, she can be seen to have been operating well within patriarchal boundaries. On the other hand, for a woman to be writing at all was hardly standard in the fourth century; to be finding ‘Christian truth’ in Vergil’s texts signalled an interesting stage in the history of the reception of his works; and some have argued that Proba’s poem was a bold challenge to the anti-Christian legislation of the Apostate emperor Julian. The work proved popular and controversial in antiquity and beyond, and is currently enjoying a scholarly revival. As a suitable coda, the cento Probae was first published in print format in 1472, making it quite likely that Proba has the distinction of being history’s first female author to have her work made available in print.